The Villager Motel is conveniently close to the Williams College as well as many other places you would like to visit in the Berkshires. 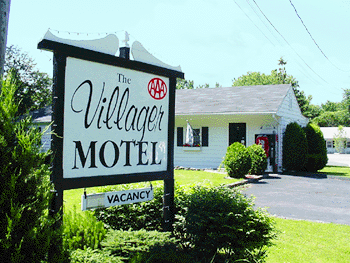 Also the Villager Motel is located within quick walking distance to 2 restaurants, the Chef's Hat and the Cozy Corner. You are within 3 minutes distance by car to many local attractions such as the world renowned Clark Art Institute, WilliamsCollege, and the Williams College Museum. Within 15 minutes you can be at the Natural Bridge, one of the most spectacular geological formations in the country. The same distance brings you to Massachusetts Museum of Contemporary Art, the largest and finest contemporary museum of modern art. Of course in the summer, you are a stone throw away to the famous Williamstown Theatre Festival and the up and coming Williamstown Film Festival in the fall. Speaking of the fall, don’t forget the spectacular burst of colors in Autumn! Williamstown is within a quick drive to Bennington, VT or Albany, New York and many more local attractions. 2 miles from center of Williamstown. 3 minutes to the Clark ART Museum. 2-3 minutes from the Williamstown Summer Theatre. 2 Restaurants just off the property. Award winning Restaurants within a 5 min drive. SHOPPING!! Just a half an hour away from Manchester Factory Outlets.